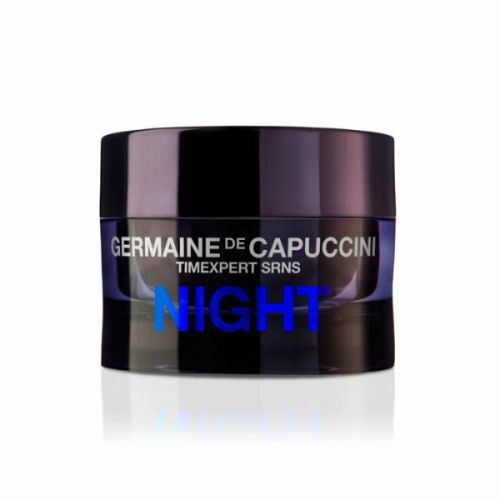 Germaine de Capuccini Timexpert SRNS Repair Night Progress is a lightweight anti-ageing serum that sinks deep into the skin to encourage cell regeneration and cell renewal. Harnessing the power of Germaine de Capuccini'c award-winning Zinc-Glycine Complex, this age fighting serum charges the skin with energy to tackle environmental and oxidative damage. Editor's notes: A powerful anti-ageing overnight serum that tackles the visible signs of maturing skin. Sodium Hyaluronate, Glycyrrhiza Glabra (Licorice) Root Extract, Chamomilla Recutita (Matricaria) Flower Extract, Retinyl Palmitate, Camellia Sinensis Leaf Extract, Panthenol, Sodium Cocomonoglyceride Sulfate, Ceramide 3, Tocopheryl Acetate, Alcohol, Menthyl Lactate, Citric Acid, Potassium Sorbate, Sorbitol, Dicetyl Phosphate, 1,2-Hexanediol, Disodium EDTA, Phenoxyethanol, o-Cymen-5-ol, Parfum (Fragrance). Apply directly to cleansed skin before going to bed. Follow with SRNS Night Cream. This serum is particularly beneficial for those ageing skin.